News and information group Reuters has agreed to be bought out by Canadian financial data provider Thomson in a deal worth about £8.7bn ($17bn). The tie-up will create the world's biggest financial news and data firm, allowing the new company to leapfrog its main rival, US-based Bloomberg. Other news firms are also eyeing deals as they seek to cut costs, squeeze rivals and increase their client base. Reuters and Thomson reckon their deal will save them $500m (£250m) a year. Reuters shares in London closed 3.39% or 20.5 pence higher at 626p. Thomson, whose publishing interests include law, tax and scientific research, has been expanding its non-data business. 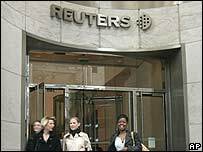 Reuters will complement its news operations in the US and AFX in Europe, analysts said. They added that a merged Thomson and Reuters would be in a stronger position to compete with Bloomberg. The three companies are rivals in the "terminal" market, providing news and financial data on stocks, currencies and bonds to banks, traders and brokerages. According to industry estimates released in April, Bloomberg has a 33% share of the terminal market, with Reuters controlling 23% and Thomson 11%. Following the merger, the new company will be called Thomson-Reuters and will be listed on stock exchanges in London and Toronto. It will have annual revenues of about $12bn and almost 49,000 employees. "The shared expertise and complementary strengths of these two companies makes for a strategically compelling and financially attractive combination," said Niall Fitzgerald, chairman of Reuters. While the companies are keen for the tie-up to go ahead, it still needs approval from competition regulators, and some analysts questioned whether they would get the go-ahead. Concerns about getting approval for the deal have held back Reuters' share price in past days, trimming some of its gains for this year. The company's shares have added more than 35% since the end of 2006. At the same time, some observers have questioned whether the agreement will damage the reputation of Reuters' news service. "For more than 150 years, Reuters has been one of the great independent news organisations. No longer," said the BBC's business editor Robert Peston. Reuters' independence has been guaranteed by the structure of the business - which prohibits any individual from owning 15% or more of the company, Mr Peston explained. However, "that prohibition is being waved for the Thomson family, which will end up owning 53% of the enlarged business", he said. "Reuters journalists are unhappy," the BBC's business editor continued. "There will be concerns that over time Reuters general news operations will become marginalised within an outfit that sees its future as supplying intelligence and tools to those who operate in global financial markets." According to the terms of the deal, Reuters shareholders will get 352.5 pence in cash and 0.16 Thomson share for every Reuters share they own. That values Reuters shares at 692p each, the companies said in their statement. Reuters boss Tom Glocer will head the enlarged firm, while Thomson president and chief executive Richard Harrington will retire. The Thomson family will own 53% of the new firm through its Woodbridge investment vehicle. Mr Harrington, who joined Thomson in 1982, has been the driving force behind the company's plans to get rid of its newspaper holdings and concentrate on legal and finanical data, as well as electronic publishing.